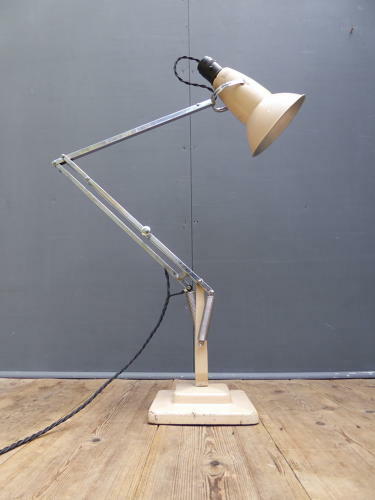 A exceptional & scarce vintage Anglepoise 1227 lamp by Herbert Terry & Sons. A stunning & very rare lamp, all original & featuring a large heavy cast iron base, original cream paintwork & chrome plated steel arms. This model really was where it all began for the iconic Herbert Terry 1227 or 'two step' lamp, production started in around 1938 & this 'crossover' model featured elements from both the earlier 'three step' & later 'two step' models. The slimmer profile, perforated shade, chrome arms & simple, 'un-capped' springs set this apart from later models and this lamp is an exceptionally original example. A handsome & timeless lamp wired in twisted black flex via the original 'Crabtree' Bakelite bulb holder. Wear commensureate with age with associated minor wear to the chrome plating on the arms & some light wear / marking to the base. Clean, untouched & all original condition, a genuine, unmolested first edition 1227. Height measurement of 65cm is taken in the classic position as per main image. All electrical items should be checked by a qualified electrician prior to use (This lamp came in with the current wiring in place though is clearly a recent rewire & it works as it should).